Arlington Central Library features some great art. 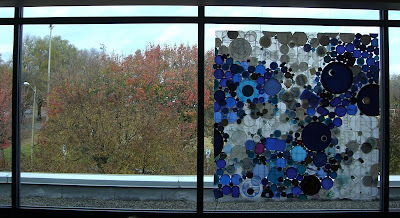 On the second floor, a window looking north features Jeff Wilson's Lids: Variation on Blue with White. This artwork is on permanent exhibition. 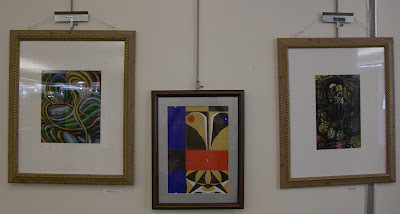 The library also has rotating exhibits by community artists. Zelalem T. Wakoya currently has an amazing set of paintings on display. The paintings range from abstract to allegorical to portraits drawing on Mr. Wakoya's Ethiopian heritage. Some of his color schemes remind me of stained-glass windows, but the compositions are more dynamic than a lot of glasswork.